Some safe drinking water bills approved by the Legislature have been signed into law by Governor Brown and four deal with water quality problems that continue to be experienced in many smaller rural San Joaquin Valley towns and villages. Two of the measures that could benefit valley disadvantaged communities in their efforts to gain safe drinking water include a pair of bills by Assembly Member Henry T. Perea (D-FRESNO). Governor Brown speaks at a Sacramento news conference on the signing of safe drinking water legislation. • AB 30, which removes a sunset date for a grant fund that provides grants to small communities for the construction of wastewater collection, treatment or disposal projects. • AB 115, which is to assist small, disadvantaged communities seeking funds to construct clean drinking water infrastructure by allowing multiple water systems to apply for state funds as a single applicant. AB 118, authored by the Safety and Toxic Materials Committee, declares certain water systems in severely disadvantaged communities as being eligible for a grant instead of a loan from the Safe Drinking Water State Revolving Fund. Two safe drinking water bills signed into law are aimed at clarifying or improving regulation by the State Water Resources Control Board, regional water quality control boards and the Department of Public Health of reuse and recycling of treated wastewater. 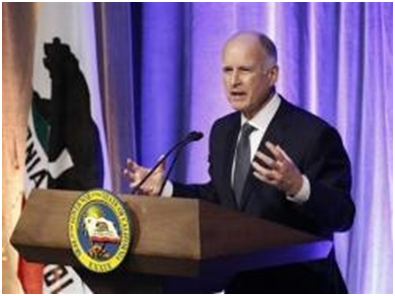 In a signing message, the Governor said information on criteria for direct potable reuse of recycled water is “past due” and called recycling the key to creating more high quality water for California. Brown also touted his plan – not enacted by the Legislature this year – to reorganize the state’s drinking water program under the State Water Resources Control Board. “In an effort to enhance the use of recycled water, I have proposed the consolidation of the management of the drinking water program and all other water quality programs, including recycled water, under the State Water Board,” the governor wrote.